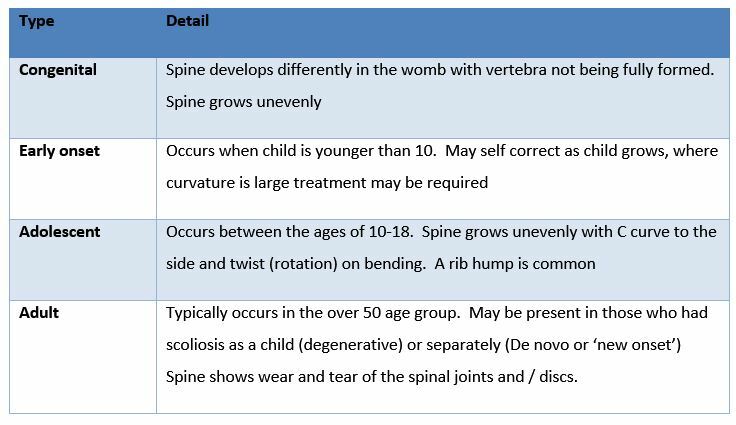 There are several types of scoliosis (table 1) each typically seen in clients of differing age groups. 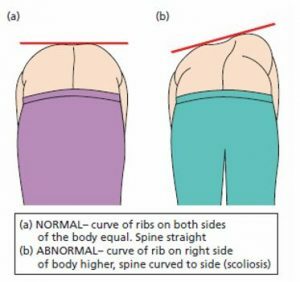 Where there is a specific bone change giving rise to scoliosis it is often termed structural, but frequently no obvious cause is found, and the scoliosis is classified as idiopathic or functional. A structural scoliosis would include change in bone shape during growth or ageing, while the functional condition can be due to changes in tissue (ligament or fascia length) or muscle tone and strength. Often both types of scoliosis have elements of changes in lifestyle (sitting posture for example) and psychological traits (anxiety and depression for instance). The approach to treatment must be biopsychosocial – addressing inter-relating elements of structure (bio), psychological influences (psycho), and lifestyle changes (social). Medically, the degree of scoliosis is measured using the Cobb angle. This is a value calculated from an x-ray of lines drawn from the upper border of the top vertebra and the bottom border of the lower vertebra of the spine C curve. Perpendicular lines are extended from the vertebral surface and the angle made as the lines cross gives the value. Generally, values greater than a 10° Cobb angle are considered Scoliotic. Patients with values of 15-20° and usually monitored and receive physiotherapy and a home exercise programme. Between 20-40° a patient may require a back brace to reduce the likelihood of the scoliosis increasing. Where a Cobb angle is greater than 40-50° surgery may be required, such as a spinal fusion. When observing a class, signs of scoliosis include the visible C shaped side curvature of the spine described above, especially noticeable when standing straight (Mountain pose, Tadasana viewed from behind). One method of see this more closely is to look at the gap between a client’s arm and the side of their body (called the ‘keyhole’ in posture assessment terms). The gap is typically larger when the client leans to that side. A difference (asymmetry) may be observed when the client is performing side bend actions such as Triangle pose, (Trikonasana) with one side showing a greater motion range than the other. This is often compensated by twisting or flexing the spine, so becomes more obvious when Triangle is practiced with the back against a wall. 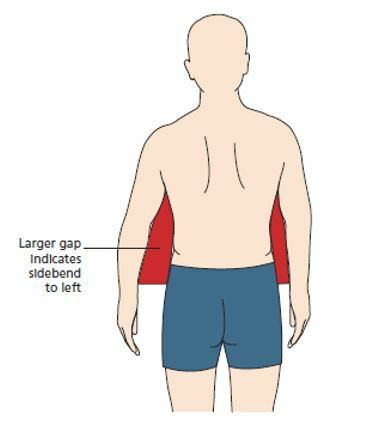 Shoulder level may be different with one shoulder or shoulder blade being held higher than the other, or simply appearing more prominent through sports clothing. This may be visible on close inspection of standing poses but becomes more obvious when reaching overhead, (Raised hand pose, Urdhva Hastasana) as the fingertips of one hand reach further than the other hand. As a client moves from standing to forward bend the spine with a scoliosis will also twist, allowing a rib to become prominent (rib hump). This occurs because the ribs attach to the spine via small joints (costo-vertebral joints) and any movement of the spine is reflected in rib joint motion. The forward bend test forms the basis of a physiotherapy test called Adam’s position which consists of assessment of the ribcage in forward bending from both standing and sitting. Physiotherapists often use Schroth technique, a form of corrective exercise which includes restoring muscular symmetry and postural alignment, breathing into the concave side of the body to expand the ribcage, and teaching posture awareness throughout day-to-day living. The aim is to treat the deformity in three dimensions (3D) focusing on the spinal side curvature and rotation, ribcage asymmetry, and ribcage movement during breathing actions. Often a focus is to perform exercises which elongate the spine by placing a traction (pulling) force through the arms. If you observe scoliosis in mountain pose, change the client to lying mountain pose (Supta Tadasana) and use your hands to gently adjust the body segments (shoulder level and hip level) to try to ‘stack’ the body segments and align the spine. Use a yoga block on the curved (convex) side of the scoliosis and belts around the ribcage where necessary. Importantly, you must encourage correct movement, but never force it. Have the client reach one arm overhead to open and lengthen the shortened (concave) side of the spine and ribcage. Encourage deep breathing using, for example 3 maximum breaths and then breathing normally for 15-30 seconds to avoid dizziness due to over breathing (hyperventilation). Encourage the client to breath into the flattened ribcage area to try to open the ribs and expand the ribcage. Progress the alignment awareness by moving to chair sitting. With the pelvis fixed by bodyweight on the chair, the focus is more closely on the spine. Practice overhead reaching with a belt or pole gripped between the client’s hands. Gently pull upwards on the pole to place traction through the client’s spine and to encourage equal movement of each side of the spine (symmetry). Triangle pose may be dissected into its component parts to build it back up, again focussing on symmetry. Have the client practice lying on the floor with their feet against the skirting board. Begin with single arm overhead reach to open the side ribcage and progress to spinal side bend (lateral flexion) encouraging a smooth curve throughout all segment of the spine. Focus on flattened or rotated areas drawing the client’s attention to these to encourage the self-awareness required for accurate home practice. Move the triangle pose to the wall and use aids such as blocks, and a chair to de-rotated the spine and gain symmetry of spine and ribcage. If you are teaching in a school, use wallbars or in a yoga studio ropes or horizontal bar (ballet bar or trestler) support.